On the occasion of the 25th anniversary of the city partnership between Berlin and Buenos Aires that has existed since May 19th, 1994, PANTONALE e.V. 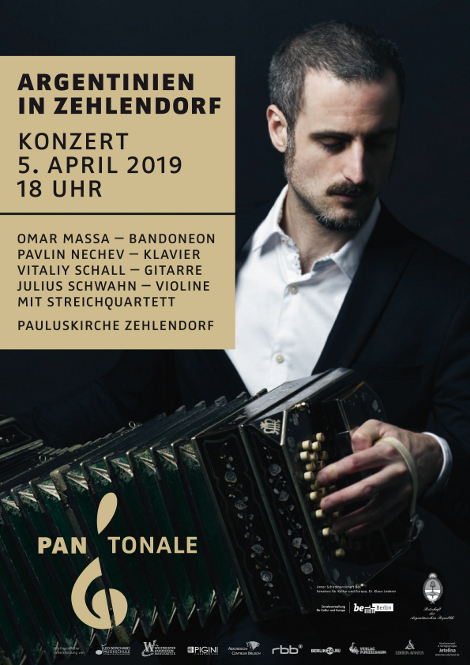 organizes the concert „Argentinien in Zehlendorf“ taking place in the framework of the International Accordion Festival PHILHARMONIKA-2019 on April 5th, 2019 at Pauluskirche. The event is held under the patronage of the Embassy of the Argentine Republic and the senator for culture and Europe Dr. Klaus Lederer and is realized with the friendly assistance of the Music School Steglitz-Zehlendorf. The artistic direction of the evening lies in the hands of the internationally acclaimed Argentine bandoneonist Omar Massa who, in collaboration with the musicians, artists and teachers of the Music School Steglitz Zehlendorf, Vitaliy Schall (guitar), Pavlin Nechev (piano) and Julius Schwahn (violon) and his string quartet, will mainly present music by Argentine composers. The best young talents of the Music School Steglitz-Zehlendorf in the subject accordion, Maximilian Kiessling (age 8), Jenny Soldatova (age 10) and Paulina Drautz (age 15) will also take part in the concert. Admission is free on a donation basis. The proceeds will be used for the purchase of a bandoneon that will benefit the musical education of young people in the district Steglitz-Zehlendorf.